We all love some pillowslip refashion around here in DIY/sewing heaven/blogland and I had this spare pillowcase after using the other one in a reversible apron last year. It's from an opshop here in Sydney, I just can't remember where! 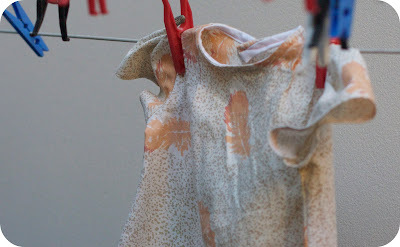 But it's cotton, vintage looking with fawn dots and peachy feathers on it, very cute! But even the buttons are thrifted, so once again, it's entirely secondhand and totes upcycled. I like the exposed pleats/darts around the neck. 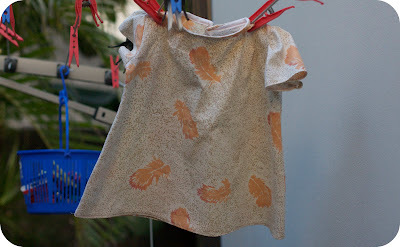 For a while there all my friends were having boy babies, and whilst they are just darling, I've been trying not to make baby clothes for them, as shirts and shorts are harder for me to think about. Dresses and tunics are easy peasy, so finally with the girl baby news (2 in the past 6 months and another few to be born soon) I'm very happy to use the smaller scraps or fabric pieces up for frocks! Anyways, I'm going to see Gossip play now (we have a major music venue right near our house, so just gonna stroll over! Luxury!) and have some fun. It's been a busy week and it's only TUESDAY. I feel like complaining a LOT, but things will get better as the week rolls on. We're going down (or up - can't remember!) the coast with friends this weekend, so can't wait for that! Cute indeed. And I do have to tell you: I do have two boys. And even though I love making dresses for my little girl, I think I have sewn more for my boys. Trousers for little baby boys are so easy and quick and I love being able to clothe them in something original, instead of all the light blue stuff from the store. Especially for boys, store bought clothing is soooo boring and all the same. So, who knows, maybe when you are looking for a present for the little boys in your life, you could try it. I bet you will find it turns out to be very satisfying and reallly easy. Have a great weekend. Sounds like fun! That is very cute.. I like the exposed darts too. Lucky friends of yours to be getting such special baby gifts!! 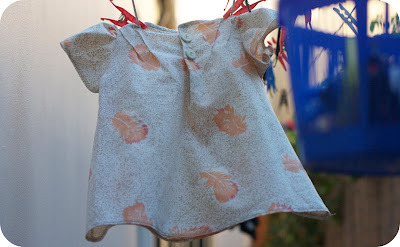 And don't worry if it is too big - I made some similar dresses for my baby niece a while back that were too big, but my sister loved them cos she could put Lil in a little long sleeved shirt or jumper underneath with the dress over the top in the winter. Then she had grown into them by the winter. So cute! Sooooooo cute! A precious piece of stash bustin'! I have nominated your for the Kreativ blogger award and here is the link http://sewithought.wordpress.com/2010/02/22/my-first-award/. Yay!